NEW YORK -- John Canemaker and Peggy Stern have completed production on The Moon and the Son, an HBO  Cinemax animated documentary film presentation featuring the voices of actors Eli Wallach and John Turturro, with an original score by Ron Sadoff, and editing and sound design by David Mehlman. The Moon and the Son explores the difficult emotional terrain of father/son relationships as seen through Canemaker’s own turbulent relationship with his father. The Moon and the Son breaks new ground professionally and personally for Canemaker, who has won acclaim for his sensitive portrayal of difficult themes through animation. At nearly 30 minutes, it is his longest personal film, and employs a variety of animation techniques -- literally drawing understanding from its dark subject matter. "I made this film to resolve long-standing emotional issues I have with my late father. I wanted to find answers to our difficult relationship, to understand the reasons he was always a feared figure in my childhood, why he was always angry and defensive, verbally and physically abusive, and often in trouble with the law," Canemaker said. Canemaker interviewed his father, John F. Cannizzaro, Sr., before the latter’s death in 1995, in an effort to get to the truth of issues that had always simmered beneath the surface of their relationship and often erupted into violence. go-getter unable to achieve his dreams; a devoted husband and father whose rage and self-inflicted misfortune devastated his family. After developing a script and storyboard, Canemaker approached producer Peggy Stern, with whom he had previously worked on Galaxy Classroom, an interactive educational media project. “Ever since we first worked together I have admired John’s ability to infuse his animated images with emotional depth. In The Moon and the Son, we have tried to express a personal history through animation in a way that I think will resonate deeply with our audiences,” Stern said. The Moon and the Son expresses Canemaker’s belief in the potential of animation to tell a complex and deeply personal story in a style totally different from live-action narratives or documentaries. "Animation, is rarely used  and, in my opinion, often ill-used  as a means to express powerful feelings,” he says. “In The Moon and the Son, I have an imaginary conversation with my deceased father. I draw upon memory, fact, conjecture, trial transcripts, audio recordings, home movies, photos, snapshots, and original animation to pull together his story and my story. "I used traditional drawn animation because that is the technique I am most familiar with and comfortable with. It is also a very direct and personal way to express myself. To use symbols, caricatures and highly stylized characters to draw out my feelings is akin to writing poetry or painting or sculpture. “There is a visceral connection between my emotions and the extension of my arm and hand to drawings on paper. This connection gives immediacy, directness and spontaneity to the artwork in a way I find lacking when a computer intervenes." Eli Wallach, who provides the voice of the father, is one of America’s most acclaimed film and stage actors in a career spanning six decades. His films include Baby Doll, The Misfits, The Good the Bad and the Ugly, and The Godfather Part III. John Turturro, in the role of the interrogative son, has won praise for his compelling performances. He has worked extensively with Spike Lee and the Coen Brothers, including memorable roles in Barton Fink, Jungle Fever, Quiz Show, The Big Lebowski, Do the Right Thing, and O Brother Where Art Thou? In addition to being a noted independent filmmaker, author and animation historian, John Canemaker has created high profile work for a number of commercial projects, including the 1989 Academy Award winning short You Don’t Have to Die, the Peabody Award winning television special Break the Silence: Kids Speak Out About Abuse; the feature film The World According to Garp, and the PBS special What do Children Think of When They Think of the Bomb? He has also written nine books on the art and history of animation, and is director of the animation program at New York University’s Tisch School of the Arts. John Canemaker is an independent animator and animation historian whose creative work has won international honors. His current film, The Moon and the Son: An Imagined Conversation, marks a personal and professional breakthrough in its treatment of a troubled father/son relationship, based on his own life. Canemaker’s personal films are noteworthy for their striking visual style and classic animation. They are in the permanent collection of the Museum of Modern Art, and have been released on video under the title John Canemaker: Marching to a Different Toon (Milestone/Image Entertainment). He has designed and directed animation for a number of high-profile sponsored projects, including the Academy Award-winning documentary You Don’t Have to Die, for HBO; The CBS television special Break the Silence: Kids Against Child Abuse, which won the Peabody Award; the Warner Bros. film The World According to Garp, and others. Canemaker has written nine books on animation history, including: Winsor McCay: His Life and Art; Felix - The Twisted Tale of the World's Most Famous Cat; The Animated Raggedy Ann & Andy; Treasures of Disney Animation Art; Paper Dreams; Tex Avery: The MGM Years; Before the Animation Begins; Walt Disney's Nine Old Men and the Art of Animation, and The Art & Flair of Mary Blair. A regular contributor to The New York Times on animation topics, Canemaker has appeared on NBC's Today, The News Hour with Jim Lehrer, and Entertainment Tonight, and lectures internationally. He has also provided on-camera and audio commentary for the DVD releases of Beauty and the Beast; Dumbo; The Fantasia Anthology; Peter Pan; Snow White and the Seven Dwarfs; Cut Up: The Films of Grant Munro; and Winsor McCay: The Master Edition. 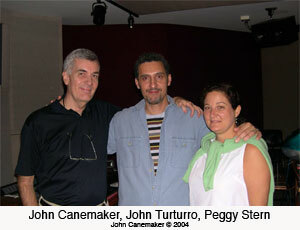 Canemaker is director of the Animation Studies program at New York University's Tisch School of the Arts. He began teaching at NYU in 1980 and became program director in 1988. He was acting chair of the Undergraduate Film and Television Dept. in 2001-02. Peggy Stern is an award-winning independent producer and director. A graduate of Harvard University, she has specialized for more than 20 years in films that focus on personal, cultural, and social issues. The Moon and the Son represents Stern’s second collaboration with John Canemaker. They previously worked on Galaxy Classroom, a series combining animation and live-action that was produced in conjunction with WGBH in Boston. In addition to The Moon and the Son, Stern is completing a series entitled American Artists: Memories of Childhood, in which individual artists (animator Chuck Jones and dancer/choreographer Bill T. Jones, among others) recall their childhood as a means of introducing audiences to different art forms. Stern’s credits include Grappling with Difference: Homework as a Place Where Schools and Families Meet, a video produced by Teachers College for distribution to parent and teacher groups. She produced and directed a segment of the PBS series A World of Art; was a consulting producer on Unequal Education: Failing Our Children, broadcast nationally as part of Bill Moyers “Listening to America” series on PBS; and wrote and directed a film series on pre-adolescent sexuality for the National YWCA. Other credits include Debut, a one-hour documentary exploring life of a young classical musician; Character Singers at The Met, produced for WNET’S “Great Performances”; Stubborn Hope, a portrait of a South African poet in exile, and Silver Valley, a feature film on the closing of a silver mine and its effects on one family in Idaho. Stern’s films have been screened at international festivals and have won many honors, including the Cine Golden Eagle, a Golden Hugo and the National Geographic Earthwatch Film Award. Her documentary feature STEPHANIE, which examined the struggles of inner-city high schools through the eyes of one teenager, was broadcast on PBS and in Europe. A sequel tracking Stephanie’s life as an adult is now in development. 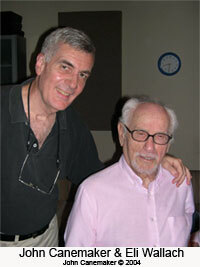 Brooklyn-born Eli Wallach has a distinguished career in theater, film and television spanning six decades. A charter member of the Actor’s Studio, he is noted for his portrayals of temperamental, highly emotional characters, often with a streak of villainy. Wallach has won acclaim for his performances in the works of Eugene Ionesco, Arthur Miller and Tom Stoppard, among others. He is perhaps most closely associated with the work of Tennessee Williams, having won the Tony Award for his performance in “The Rose Tattoo,” and subsequently starring in “Camino Real” and his debut film, Baby Doll. Other notable films include The Misfits, The Magnificent Seven, The Good the Bad and the Ugly, Lord Jim, How the West was Won, and The Godfather Part III. He is married to actress Anne Jackson, who is his frequent performing partner. John Turturro  also born in Brooklyn  is a leading figure in contemporary independent film, as an actor, writer, director and producer. He studied at the State University of New York at New Paltz and then won a scholarship to the Yale School of Drama. After gaining recognition for stage performances, including an Off-Broadway Obie Award for “Danny and the Deep Blue Sea,” he became best known for his film work with the Coen brothers and Spike Lee. This includes roles in Barton Fink, Miller’s Crossing, The Big Lebowski and O Brother Where art Thou? for the Coens; and Do the Right Thing, Jungle Fever and She Hate Me for Lee. Other notable performances include Robert Redford’s Quiz Show and Martin Scorcese’s The Color of Money. Turturro has also directed and co-written several films, including Illuminata and Mac, and his current productions Romance and Cigarettes and The Doorman. Click here for this press release as a pdf file! JohnCanemaker.Com, www.johncanemaker.com © 2000, 2003, 2004. All Rights Reserved. The website is for education and information use only. All contents may not be reproduced or distributed without the express written consent of John Canemaker. Under no circumstances shall John Canemaker and www.johncanemaker.com, its subsidiaries, or its members be liable for any direct, indirect, punitive, incidental, special, or consequential damages that result from the use of, or inability to use, this site. Website by SJB © 2000, 2003, 2004. All Rights Reserved.